Sixteen years before Michigan was admitted as the 26th state of the Union, when Michigan’s population was 8,767 and before John Quincy Adams was inaugurated as the sixth President of the United States, Birmingham First was taking shape. Meetings were held at Willits Tavern in a town called Piety Hill, later known as Birmingham. The year was 1821. Worshipers met in barns and homes and were visited occasionally by a Methodist circuit rider who journeyed into town on horseback. The first church building was built in 1839 at the corner of Merrill and Bates Streets (the present site of the Baldwin Public Library). It was a great undertaking for the 37 members. On November 2, 1873, the Birmingham Methodists moved into a new brick church located at the corner of Maple and Henrietta Streets…worth $20,000! At that time there were 141 members. 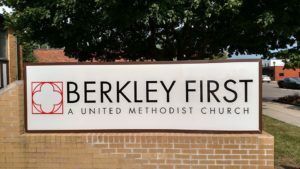 In 1939 our church became known as the First Methodist Church, a name which would continue until 1968 when we became known as the First United Methodist Church. By 1946 our congregation had grown to 634 members. “Now we shall build again” became our slogan. In January 1951, the church property was sold and a five-acre site was purchased at the corner of Maple and Pleasant Streets. On Christmas Day 1950, ground was broken for our new church facility. The cornerstone was laid on April 15, 1951, and the congregation moved into the new structure on September 7, 1952. Consecration services were held on October 5, with Bishop Marshall Reed presiding. It was the culmination of nearly eight years of labor and sacrifice and six building fund crusades. In 1957, ground was broken for the Chapel of Prayer (later renamed Runkel Chapel), together with the west educational unit, additional offices and the Choir Room. The Chambliss Outdoor Worship Center was dedicated on June 16, 1974. During the 1990s, many improvements were made to the church and grounds. All of the classrooms on the second floor were renovated, a new sound system was implemented, an elevator was installed, and landscaping of many of our gardens was completed. On September 29, 2002, we celebrated the 50th anniversary of our move to the current church building. On the same day, we broke ground for our Christian Life Center. In 2005 we completed a renovation of the sanctuary, including the installation of a new organ made by the Schoenstein and Company in San Francisco, CA. In 2012 we renovated the “South Wing” to make both the Main and West Entries completely accessible and renovate Fellowship Hall, Thomas Parlor, and the nearby restrooms. From our inauspicious beginning in 1821, we have grown to be one of the largest United Methodist churches in Michigan today.